Five year old Hannah Moreau had a birthday party the other weekend. Instead of gifts, she asked her party guests to bring a pair of pajamas. 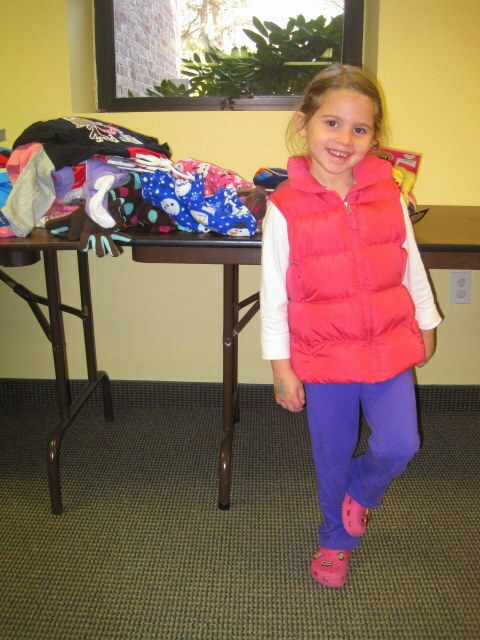 On November 11th, Hannah, her younger brother, Kevin, and their mother, Allison, delivered 20 pairs of pajamas, 8 pairs of mittens, 6 warm winter hats and 2 scarves to JFS. Thanks to Hannah’s kindness, 20 vulnerable children in our community will have a brand new pair of PJs to wear this winter. What a wonderful deed! Thanks Hannah!! Hannah in front of the table of PJs! Inspired? You too, can be like Hannah! JFS is currently holding 2 big Holiday Collection Drives now through the month of December. We’re currently collecting Winter Accessories for families that benefit from our Family Assistance Network program, a program that provides aid to local families during their time of need. We’re looking for donations of warm winter hats, gloves, mittens and scarves–child or adult sizes. Sets or separates. We’re also launching our first ever Gift Card Drive. More information, including how and where to send your gift cards/winter accessory donations, can be found on our homepage. Click on the “Give a Gift” icon on the left hand side. Questions? Give us a call at 508-875-3100.